The salmon are in! We’ve had over 30 inches of rain so far this season at Rock Creek Ranch and plenty of great flows. Big fish are in all the major tributaries and spawning action is underway. Earlier this month, two Dual Frequency Identification Sonar units — known as DIDSON — were installed in the lower Smith River to enable biologists to better estimate the number of migrating fish that swim up and down the river. This two-year pilot study is being funded through the Department of Fish and Game’s (DFG) Fisheries Restoration Grant Program and their Steelhead Card. SRA and a group of long-time anglers and sport-fishing clubs have agreed help raise matching funds to support the project. Local fisheries biologist Zack Larson is managing the study. The DIDSON units use multiple beams of sonar to provide high quality images of the fish that pass through the beams. The units can spot fish up to 80 meters out into the river night and day. Individuals interested in making a financial contribution in support of this project can send a tax-deductible contribution to SRA and specify “DIDSON” on the check. 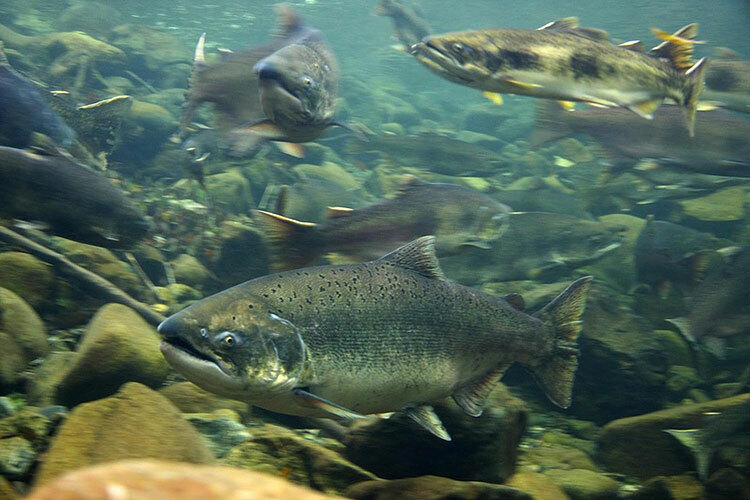 Pacific Coast coho, chinook, and steelhead populations have declined precipitously over the last fifty years. When asked what SRA is doing to prevent decline of salmon stocks in the Smith River watershed, we respond by describing restoration work in the upper reaches of the Mill Creek watershed to remove failing roads and culverts — legacies of the industrial history of this tributary to the lower Smith River. A failed logging road or a plugged culvert that “blows out” can have catastrophic impacts on water quality, aquatic and riparian habitats, and salmon species — in the streams below these disasters. The impacts to fish and other aquatic species and their habitats can last for decades and sometimes much longer. For this reason, an aggressive erosion control and prevention program within the Mill Creek project area is underway to treat and stabilize the highest-risk sites which include miles of partially decommissioned and abandoned logging roads that are part of the former industrial timberland. How much erosion has been prevented? Over 618,000 cubic yards of soil and debris that could have been delivered to down-slope and adjacent streams has been stabilized. That volume would fill 68,633 dump trucks — enough to cover the distance from Sacramento to LA, if those trucks were bumper to bumper!!! 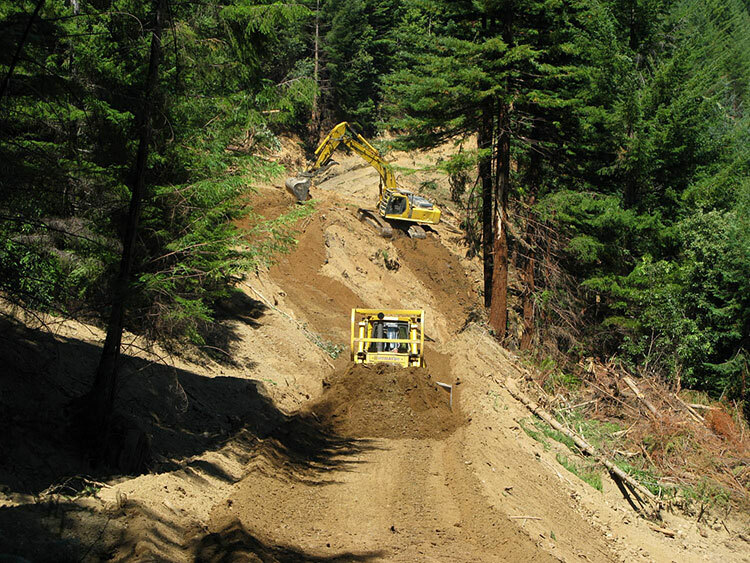 Nearly 50 miles of at-risk-of-failing logging road have been removed including hundreds of “landings” and old and undersized culverts. Dozens of other culverts have been replaced and a special winter storm patrol has been funded to monitor the existing road system and keep the ditches and culverts clear during the rainy season. This multi-year effort is an excellent example of measurable progress in erosion prevention and control. This effort and others like it in the basin will protect and restore aquatic and riparian resources in the Smith’s most productive tributaries. 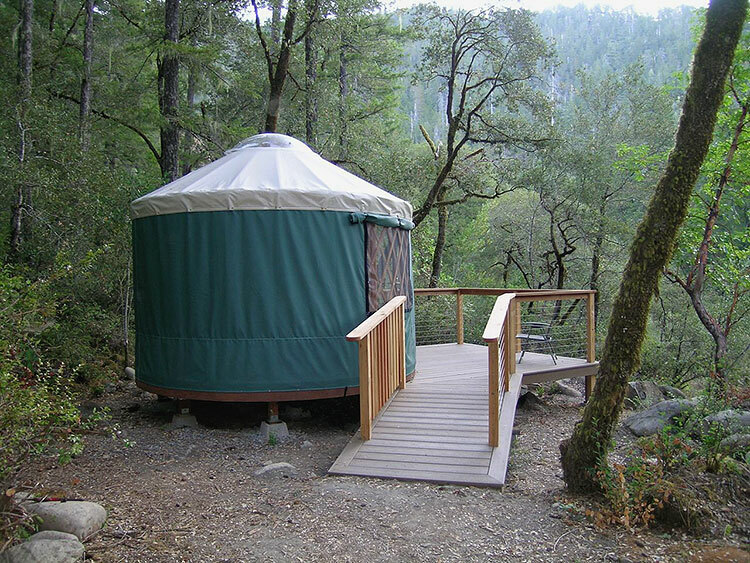 Rock Creek Ranch now has a yurt overlooking the river with a view of the Majesty Pool. The yurt was the preferred overnight spot for summer and fall visitors because of its inspiring and private location — and the unique roomy/open feeling inside the round dome structure. The yurt is a modern adaptation of the ancient shelter used by Central Asian nomads for centuries. The compact shape and lightweight beams are a low-cost and modern version that retains the ancient form of nomadic tents of Mongolia, which were covered with animal skins. Rock Creek Ranch depends on volunteer work parties to accomplish key projects throughout the year. 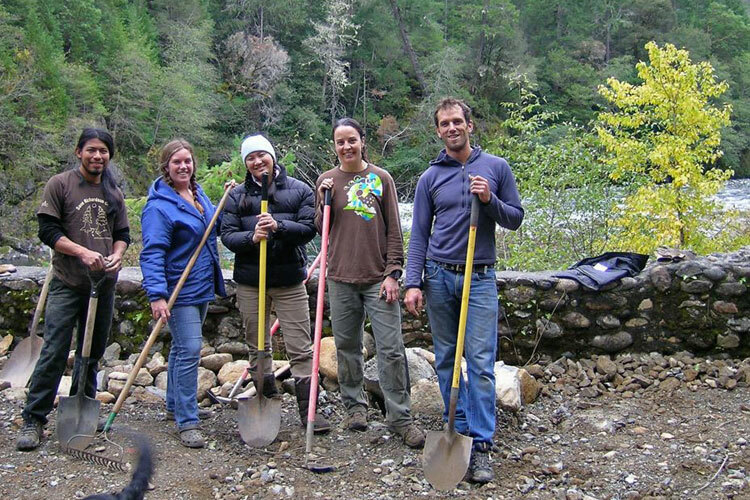 In 2010 volunteers have built a new sleeping deck, erected the yurt, removed invasive plants and launched an initiative to fully restore the Majesty Pool overlook, damaged by high water a couple of years ago. Send us an email at info@smithriveralliance.org if you want to be notified of work projects and opportunities.